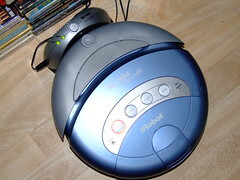 Our new Roomba Scheduler at its charging station. I really want one of these but they suffer from dalek syndrome and I have many stairs ;-). BTW have you seen these http://myroombud.com/ ?